Island Mazda near Staten Island, NY has the all-new 2017 Mazda CX-3. A subcompact crossover SUV, the head-turning combines the maneuverability of a small hatchback with the extra height of a crossover. It also features available all-wheel drive, Mazda’s trademark sporty handling and a stylish, well-equipped cabin with a standard touchscreen interface. Island Mazda near Staten Island, NY has tons in stock that are equipped with a 2.0-liter four-cylinder engine rated at 146 horsepower and a matching 146 pound-feet of torque. A six-speed automatic is the only available transmission. Front-wheel drive is standard, with all-wheel drive offered as an option on all trim levels. All told, it’s one of the nicest and most fun-to-drive vehicles in its class. Head to Island Hyundai near Staten Island, NY today to test drive your all-new 2017 Mazda CX-3. Even in its Sport model, the monotone black cloth upholstery looks good and upping the ante to the Touring model’s Leatherette or the Grand Touring model’s leather/Lux Suede seats with second-color piping sweetens the deal into luxury territory. With the GT you also get soft-stitched material over the gauge hood. The cockpit is geared toward the driver in what Mazda calls its “Head-up Cockpit” concept. The gauges themselves are housed in a well-defined nacelle, and the iPad-like infotainment system includes text-message audio delivery, voice command, and apps like Aha and Stitcher, with the screen fashionably mounted atop the dash. Mazda designer Ken Saward says the goal of the CX-3’s exterior is a car that is “genuinely beautiful while practical.” No question that Mazda nailed the “beautiful” part. The coupe-like cabin and long hood evoke classically sporty proportions, and the flowing lines and distinctive grille all look good here. It looks all the world like a slightly raised Mazda3 5-door hatchback. 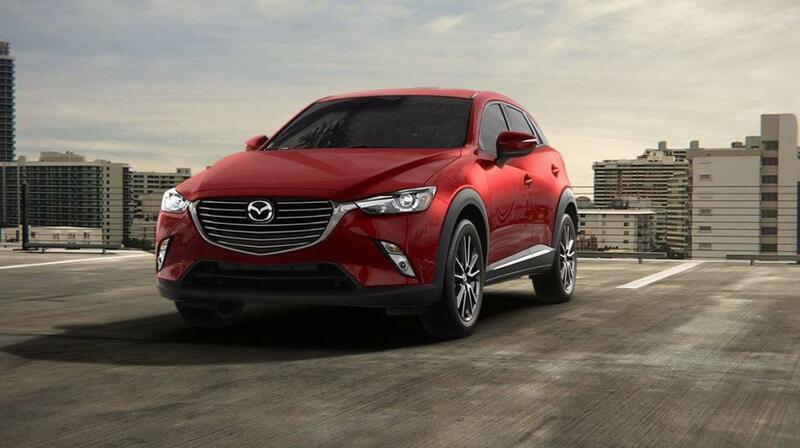 Click here to learn more about how you can get your new 2017 Mazda CX-3.